Today I wanted to share with you "The Making of the CHANEL Spring/Summer 2015 Haute Couture Collection" for some delicious eye candy. This two-and-a-half minute video is bound to make you smile and feel inspired. Wonderful for those of you who enjoy fashion, artistic handwork, flowers & sparkle! I'm excited to share with you today my photos from my Turkish Delight fabric collection photo shoot! Turkish Delight launched in July of this year with Blend Fabrics and has 6 prints and 2 gorgeous colorways: a blue & green combo and a coral & lavender combo, both set against charcoal grey as a neutral. There are a total of 14 fabrics in the collection. For this collection I was really inspired by Turkish and Islamic ornamentalism from the 19th century. The architecture, tile work, and pottery from that period are absolutely stunning and provided an exciting challenge to create something with a modern vibe. For the photo shoot I wanted to bring some of this inspiration and culture to the photo's, and I did this by building this enormous card wall which had a combination of my artwork from the collection and photo's from Turkey sprinkled throughout. I worked with a wonderful team of sewers to create 7 garments, so you could see how wonderfully the fabrics play together and how well they can work for your wardrobe! The sewing patterns I chose this round are from a handful of independent designers who had wonderful, modern patterns that can easily be worn today. I'd love to share with you a few of the projects and the sewers who made this vision a reality! First up, my absolute FAVORITE of them all is this stellar "Ailakki Cross Front Jumpsuit" by Named Clothing. When the model came out in this number, all of us just gasped and said we want one just like it! Word to the wise though - my dear friend sewed this for me and she is an expert. Like, she can make wedding dresses out of satin using no pattern and have them form fit the bride with no ripples at the seams, expert. She said that this sewing pattern was a nightmare, unfortunately, because they should have provided more markings on the pattern itself to make putting it together easier. Also, the instructions were very confusing (and she could put it together without instructions). So if you decide to take this one on, please be prepared...and maybe even make 2 copies of the sewing pattern because the pieces overlap and otherwise you will just need to trace everything. I would also say that it runs a little small. We made a size 4, and it came out more like a 0-2. But it's GORGEOUS isn't it!?!? Next we have "The Riding Party Dress & Peplum Top" by April Rhodes. Jill from LoveJill on Etsy made both the dress and the top for me out of this pattern, as I absolutely LOVED both! What's even better is that they fit well and looked absolutely gorgeous on. I've had so many people ask me about this dress! It's a definite winner for your closet for sure, and pretty simple to make. 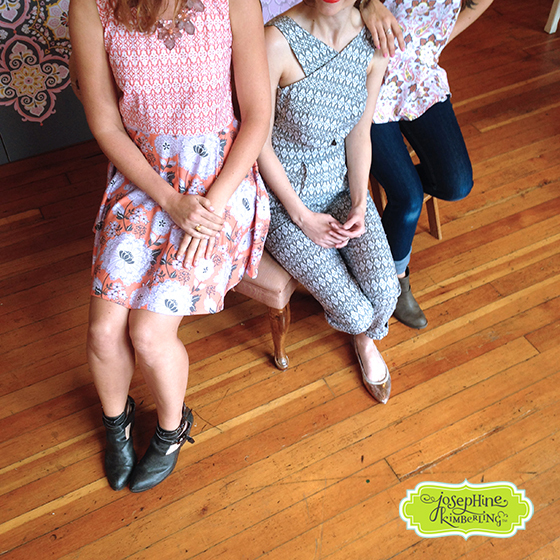 Another sewing pattern that we used was "The Clover Top & Dress" by Brooke Tyson from Papercut Patterns. Another 2-in-1 sewing pattern! I really loved the inset lace at the bust for a unique pop of texture and color. Jill from LoveJill on Etsy sewed up these 2 lovelies for me too! My friend Brittany sewed up this cute tunic "Roxanne" by Victory Patterns. We made the back panel a different fabric to add some interest, which made the top really pop! Last up is the "Polly Top" By Hand London, sewed for me by the amazing Jill of LoveJill on Etsy, which is a free sewing pattern! For this top I combined it with chambray denim for a fun mix. I invite you to swing over and watch the Turkish Delight slideshow for more images from my photo shoot to be inspired for some fun projects! Be sure to head over to my Resources/Sewing Inspiration page to get all the details of the sewing patterns and fabrics used, so you can add some lovelies to your wardrobe!! I hope you had fun seeing some fun sewing inspiration this morning! Happy Monday to you! All photography by the amazing Natalie G. Photography. Introducing My Latest Fabric Collection "Blown Away"! I Spy: My Caravan Dreams Fabrics Made Into Pillow Patterns! Today I wanted to share with you another of my favorite runway designers from Resort 2015 - Valentino. Striking, yes? What I love about this collection is not only the sheer size and variety of it (83 looks total), but from the images I'm sharing in this post, it could look like 5 different collections! My favorites are the exuberant and bold mix of geometrics and stripes (check out the show in it's entirety, as there are many more of these! ), the exquisite embroidery and applique patterns, the colorful lace and the butterfly camouflage. Truly stunning!! I hope you enjoy this delicious eye candy!